"By the power of Grayskull!" If you were a child of the 1980s, those words likely yelled from your TV screen at least once or twice, if not hundreds of times. 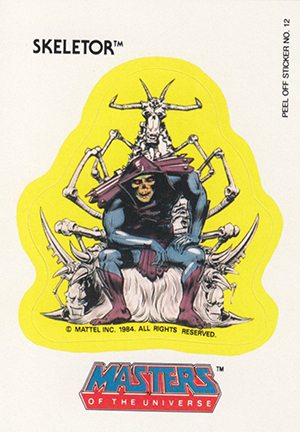 1984 Topps Masters of the Universe trading cards capture the exploits of He-Man, Skeletor and many of the show's other other-worldly warriors with a simple, albeit quirky, release. The 1984 Topps Masters of the Universe set has 88 base cards and another 21 stickers (22 if you count a variant back). The base set retells an episode of the cartoon, Like Father, Like Daughter, as though it were a comic strip. 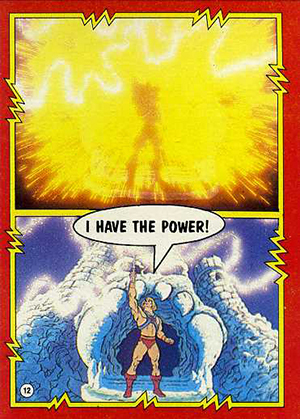 The red-bordered cards use stills from the show (sometimes a split image with two shots) and add dialogue through speech bubbles. Card backs have a blue background with a scroll design. The Masters of the Universe is on top and a more detailed writeup follows. Stickers, which were inserted one per pack, are done in two different styles. The first ten have action-oriented scenes, often with good guys and bad guys blasting one another. The final 11 stickers are character-focused and use the thick-colored border that is common among Topps stickers from the era. Sticker backs double as puzzle pieces. Sticker 19 has two different backs, one for the blue-bordered puzzle and one for the red-bordered puzzle. Packs come with ten cards, one sticker and a piece of gum. They have four different wax wrappers, each featuring a different character: He-Man, Skeletor, Orko and Teela. Also available are 45-card rack packs. 1984 Topps Masters of the Universe trading cards are a little tougher to find than a lot of other entertainment sets from the decade. It's by no means rare, but it isn't as prevalent as a lot of others. As a result, expect to pay a small premium over what you might for a comparable set released around the same time. 2 Like Father, Like Daughter! 11 Commanding the Mystic Forces! 15 The Road to Castle Grayskull! 16 Summoned to the Castle! 17 Keeper of the Castle! 18 The Plan of Skeletor Revealed! 20 Final Words of Warning! 22 No Adventure for Teela? 26 A Friend in Need! 34 Attack from the Sky! 38 The Plan to Capture Man-at-Arms! 39 Power of the Bolts! 40 Master of Evil Creatures! 48 The Man and the Challenge! 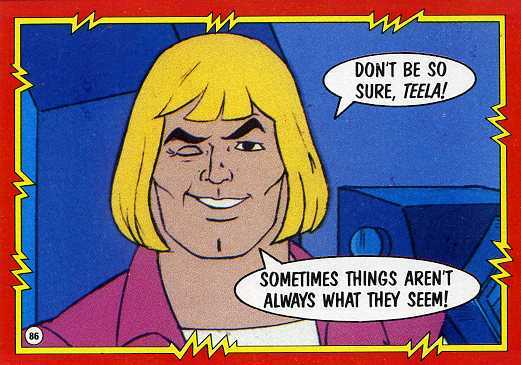 51 He-Man Wins the First Round! 55 Monsters on the March! 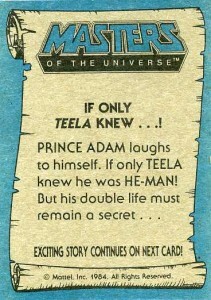 61 Teela to the Rescue! 65 In the Right Hands! 69 Bested by Our Heroes! 71 We're Not Through Yet! 75 to Rescue a Warrior! 78 Bravery Wins the Day! 80 Until Next Time? -- ?! 82 Courage: A Family Tradition! 86 If Only Teela Knew...! 21 cards. Sticker 19 has two different puzzle pieces on the back.